Do you own a Yellow Car? Or know someone who does? 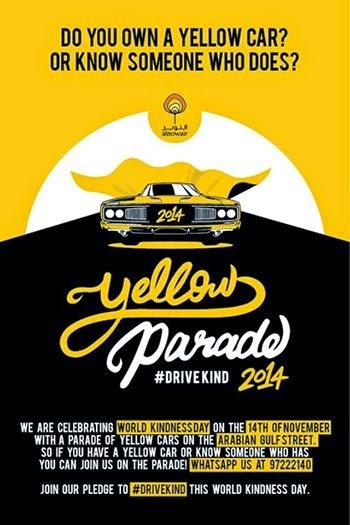 World Kindness Day celebration is on the 14th of November with a parade of Yellow Cars on the Arabian Gulf Street, starting from Marina till Green Island. On this World Kindness Day let’s take the vow to drive kind on the roads and let’s make Kuwait a kinder more positive place! So if you have a yellow car or know someone who has you can join us on the Parade! Whatsapp at 97222140 . Drive kind this world kindness day. Update : The parade will start from 'Hard Rock Cafe', near Marina Waves, Marina Waterfront, Salmiah. The event is schedule to start at 1pm with the parade commencing shortly after.